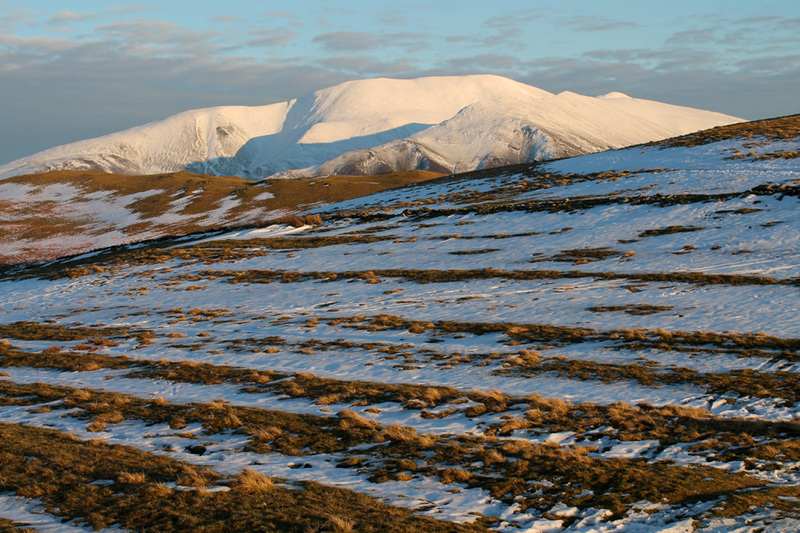 " Sale Fell in the Snow "
Location of Start : Roadside near Brumston Bridge, Wythop Mill, Cumbria, Uk. 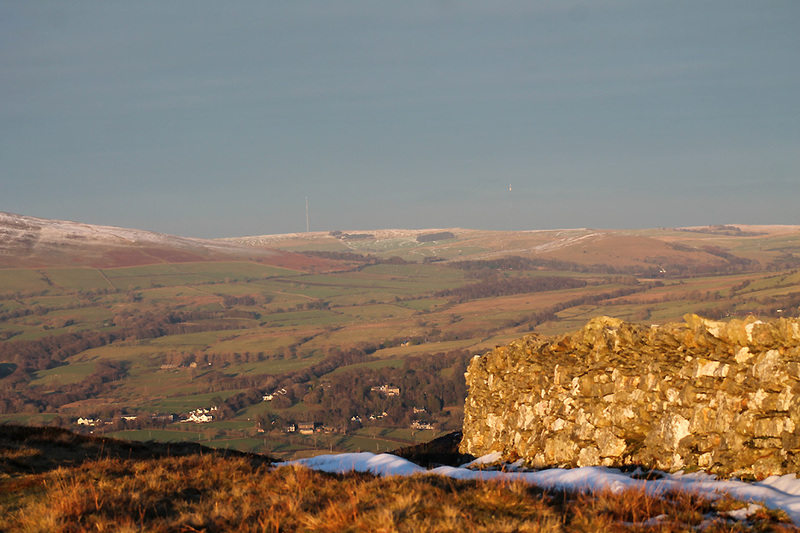 Places visited : Sale Fell, Lothwaite (Side) Summit, Kelswick Farm and back. 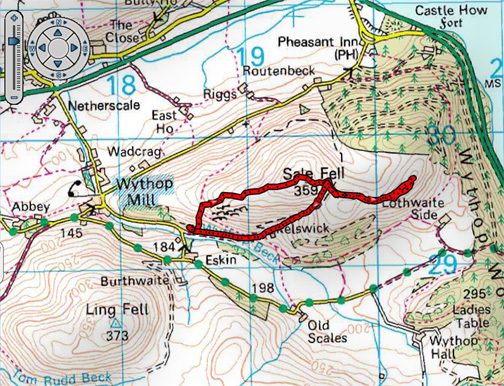 Walk details : 2.7 mls, 700 feet of ascent, 1 hour 55 mins. Highest point : Sale Fell 1,177ft - 359m. Walked with : Ann and the dogs, Harry and Dylan. Weather : Glorious afternoon sunshine. A beautiful day with superb long distance visibility. 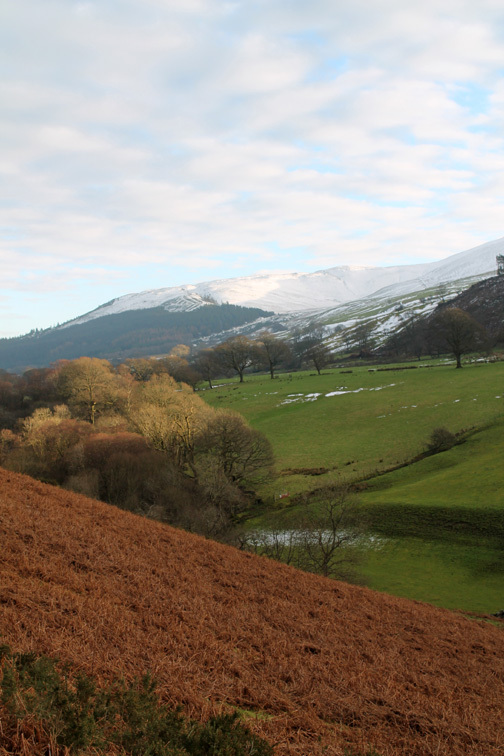 An afternoon walk finds us climbing Sale Fell because of the extensive views from this north-western fell. The high tops are still covered with pristine, white snow but the warm sun has caused most lowland snow to melt. Ann and I park at the top of the Wythop Mill road near Brumston Bridge, on the road leading to Kelswick Farm. Through the gate and it is a steep climb up alongside the wall. A fast rate of climb means the view expands quite rapidly. 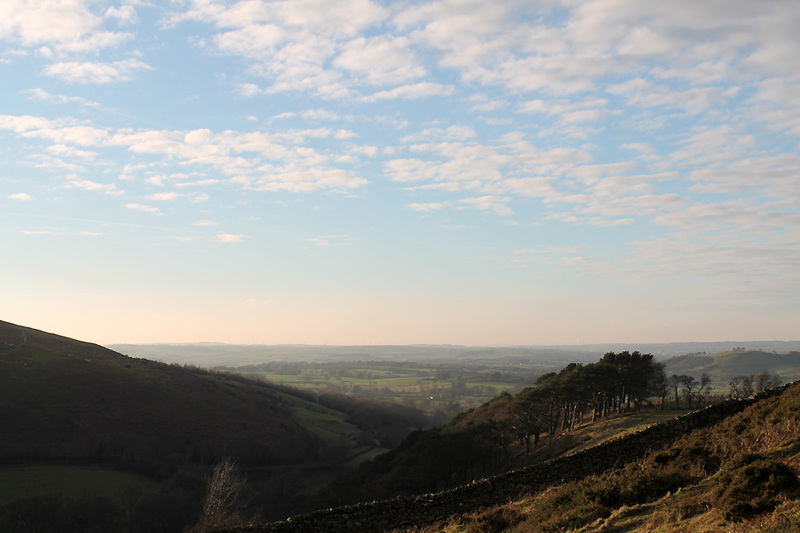 Looking west over the wall to the pines of Fisher Wood. Beyond is the Solway Plain and the view looking down from Cockermouth all the way to St Bees Head. 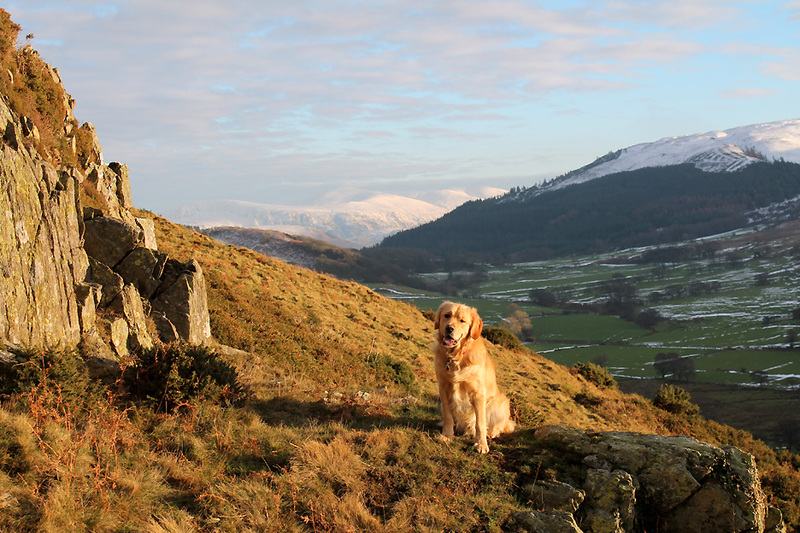 On Dodd Crags, Dylan stops to have his picture taken. 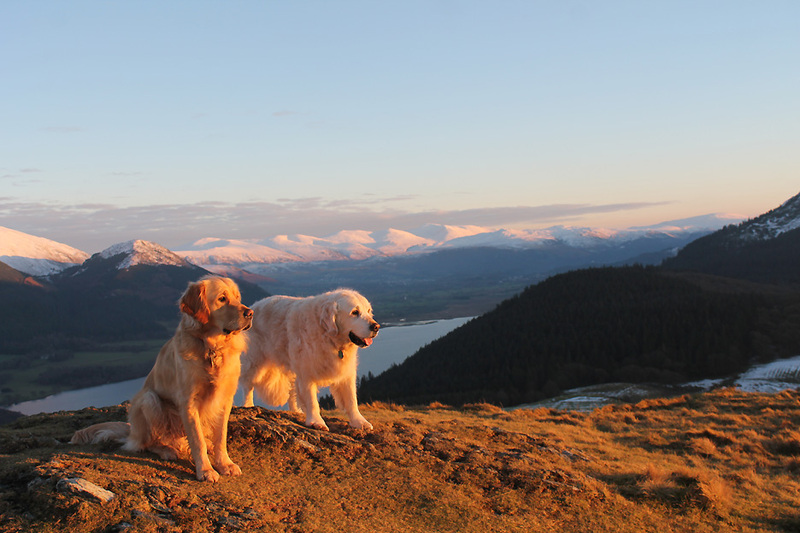 To be fair we'd better take one of Harry too, on the next set of crags up the fell.. 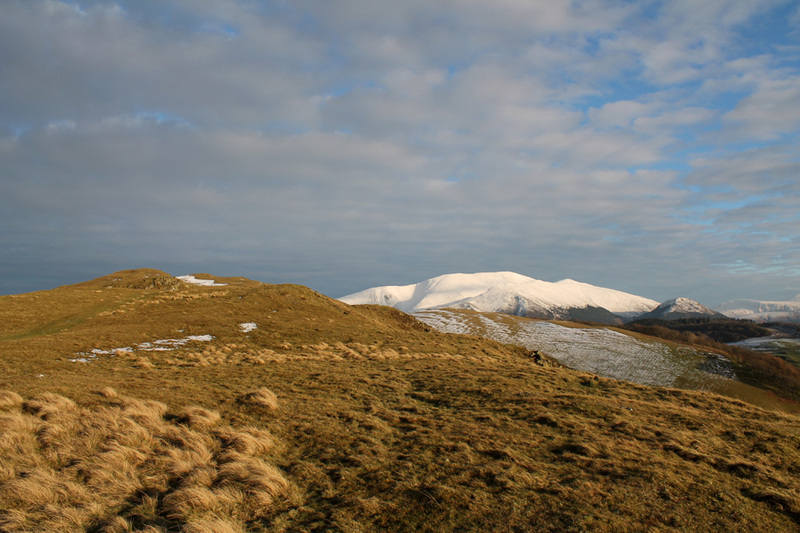 Behind is the high point of Lord's Seat and (right) Broom Fell with a good covering of snow. Nearing the summit and the high fells beyond start to come into view. 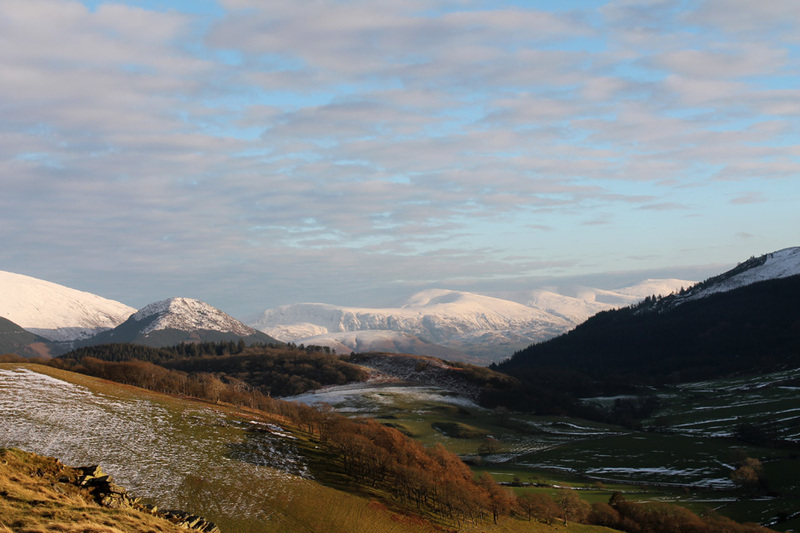 A little further and the northern half of the Helvellyn range is revealed. 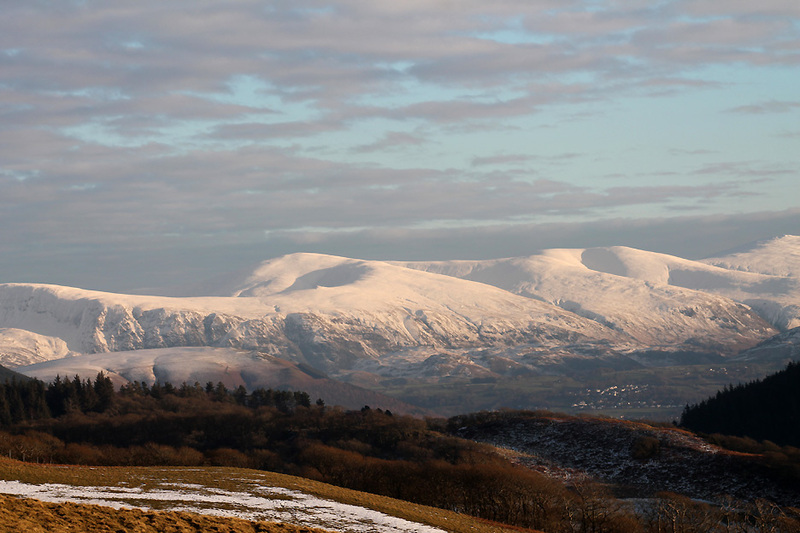 The snow covered top of Binsey . . . plus a 'selfie' of the photographer no less ! 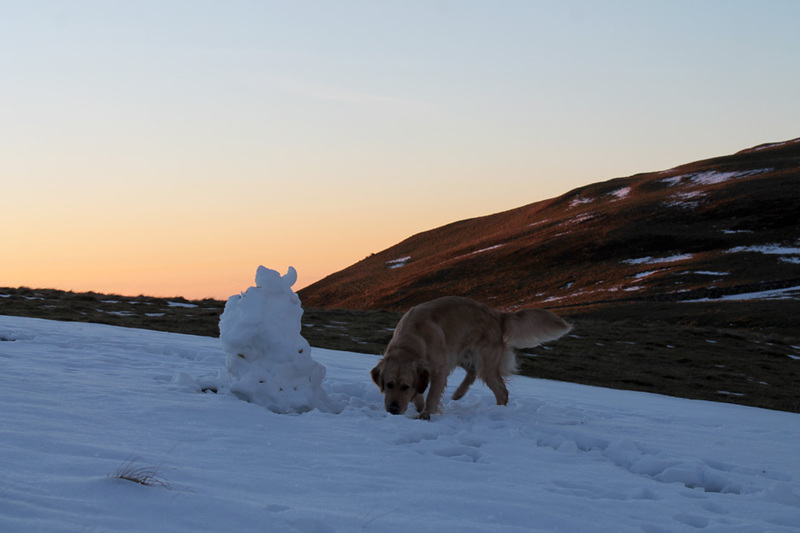 Under a northern facing fold of the summit area there was a slightly deeper drift of snow catching Dylan's interest. It has been of interest to others too . 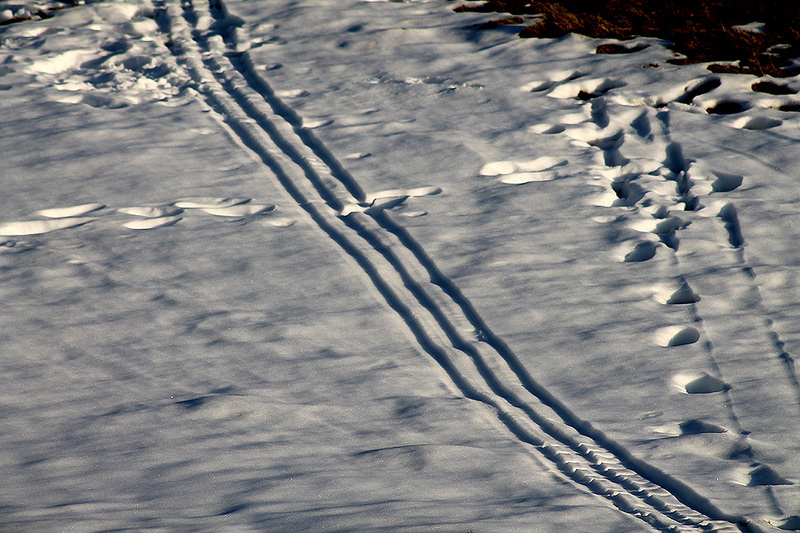 . . one of several short tracks of someone's sledge ride.
. . . but the real view is from the summit. 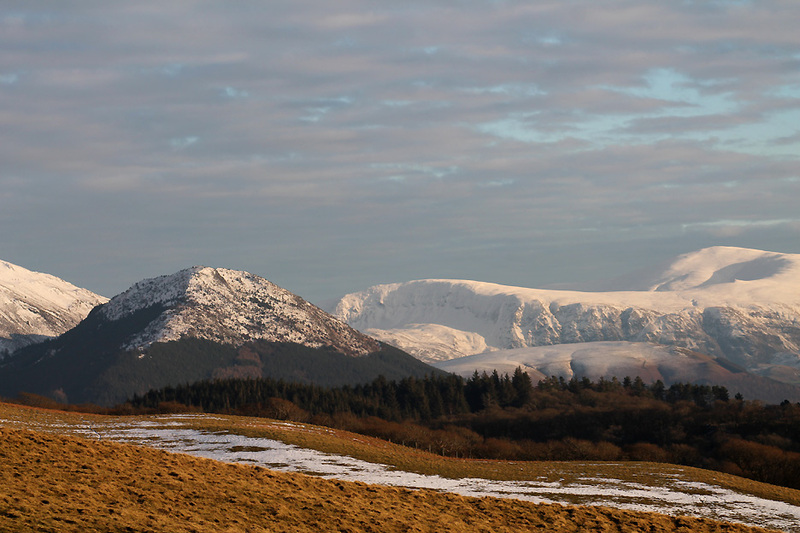 With the bigger lens in place I can zoom in on distant Browncove Crags and Helvellyn. 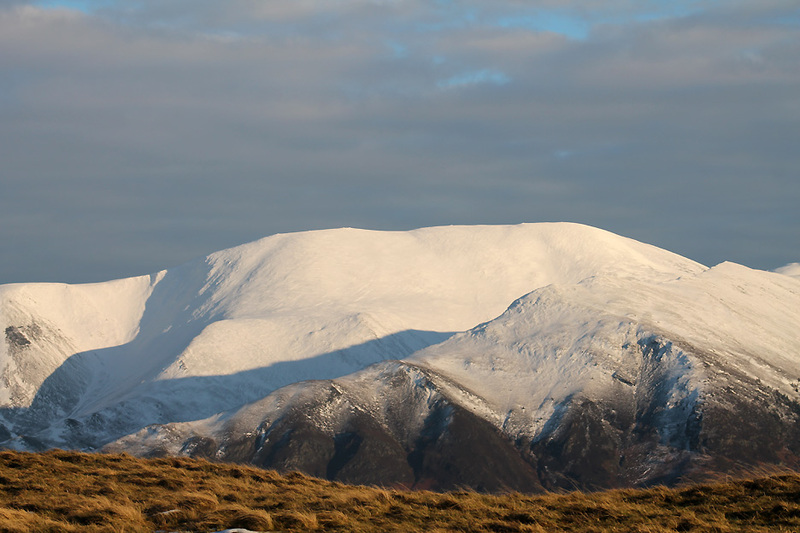 To the left of that is Helvellyn's Whiteside and Raise and then on to the Dodds. 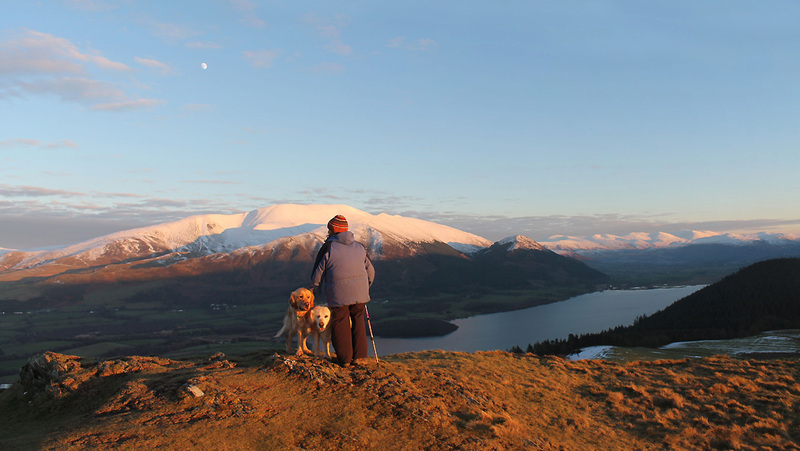 Watson Dodd, Great Dodd and the small rocky outcrop of Calfhow Pike. 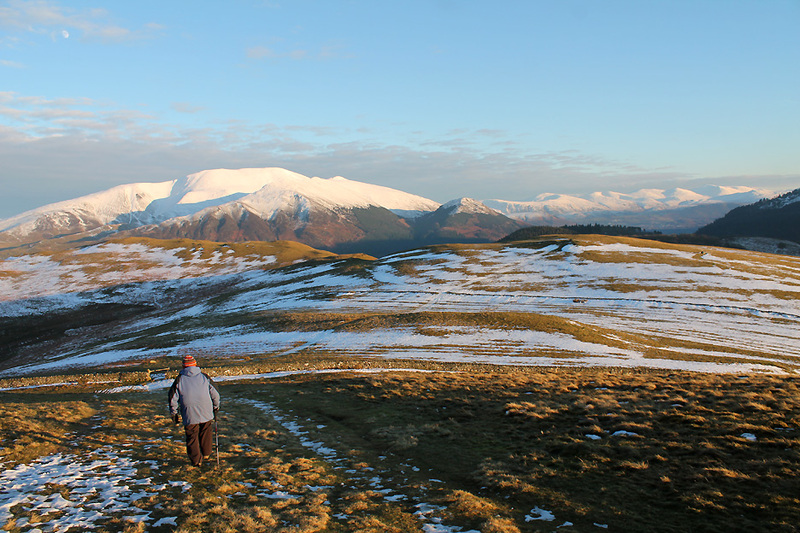 Looking left from Calfhow is Clough Head and the forested summit of Skiddaw's Dodd Fell.
. . . one of the best ways to climb this 3000ft summit. 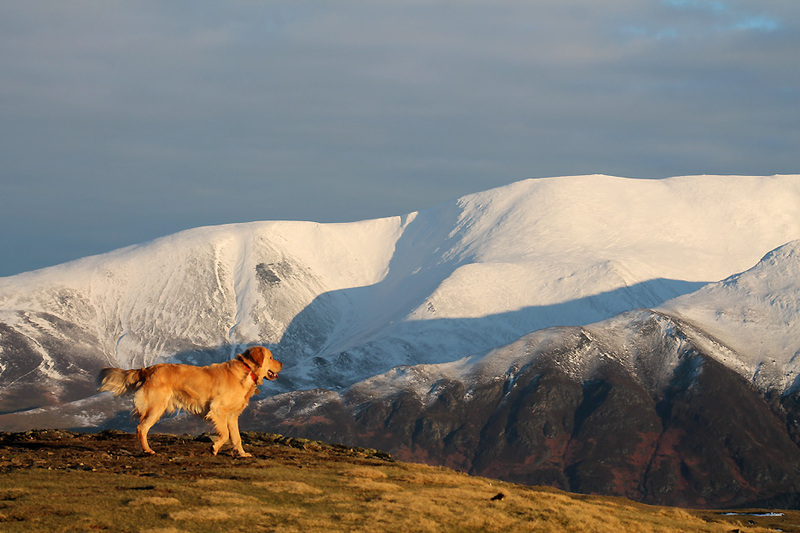 The brown sided summit to the right is Cockup with The Knott, the large summit behind. The brown summit to the left is Great Cockup with Lowthwaite Fell and Longlands behind. 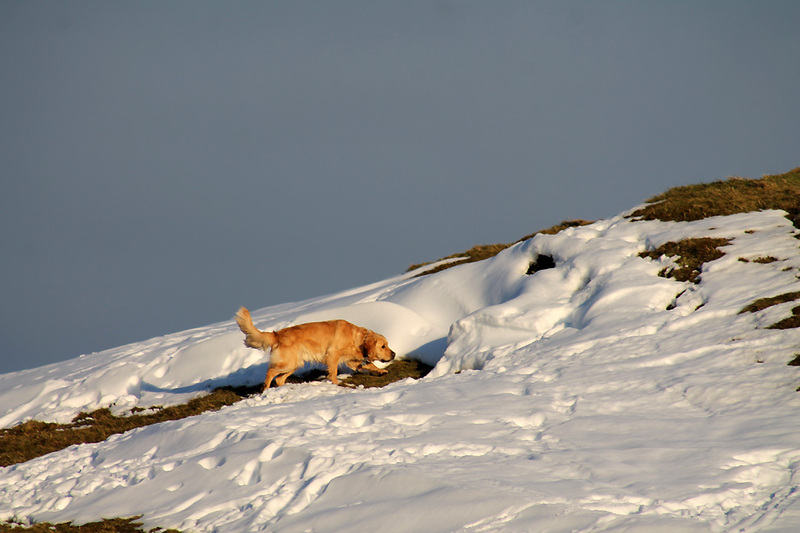 Dylan on the summit of Sale Fell. 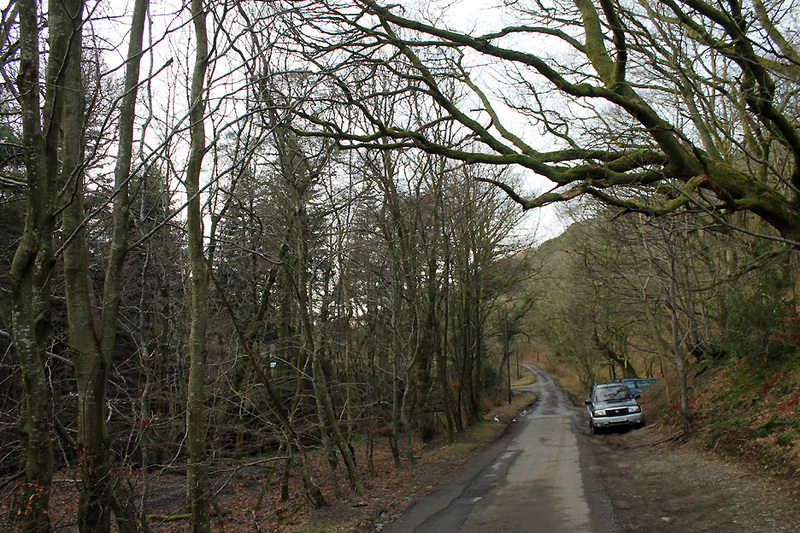 Time to move across to Lothwaite to see if we can get a view of Bassenthwaite Lake. 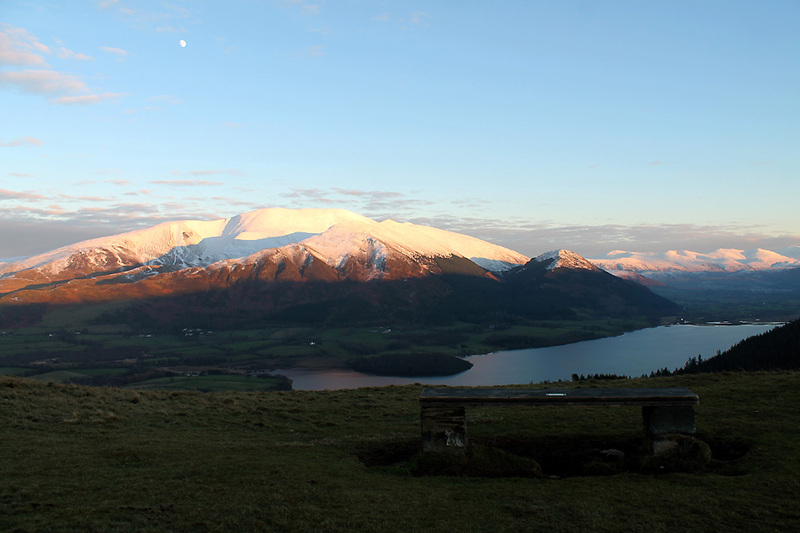 At the gate we look across at the TV mast high above Bassenthwaite Village. To the right of it above the wall is a strange white, rocket-like object in the sky. 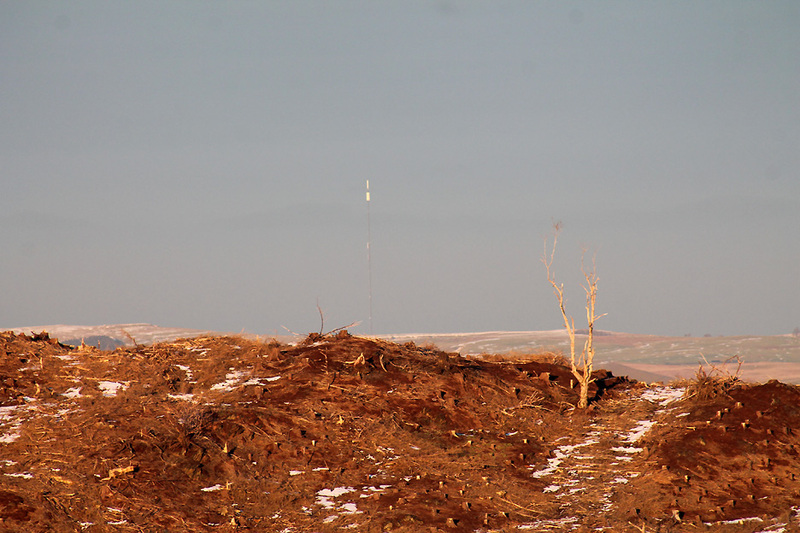 Zooming in over the tree-felled summit of Lothwaite we can see its the antennae of a second TV mast. 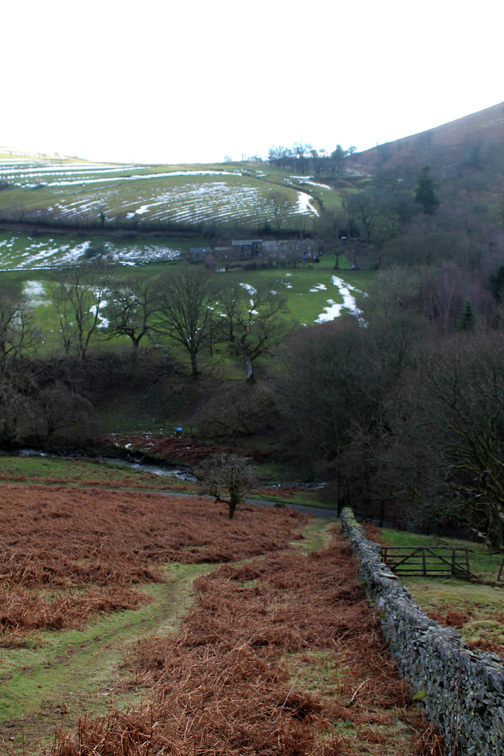 Down from the summit and back up the gentle slopes of Lowthwaite Side. The area has been ploughed for arable production many years ago and the snow is captured in the undulations. First view down from the cairn on the Rivings is of the forested Lady's Table.
. . . but a little further on the lake comes into view and gives us a real panorama into the high fells. 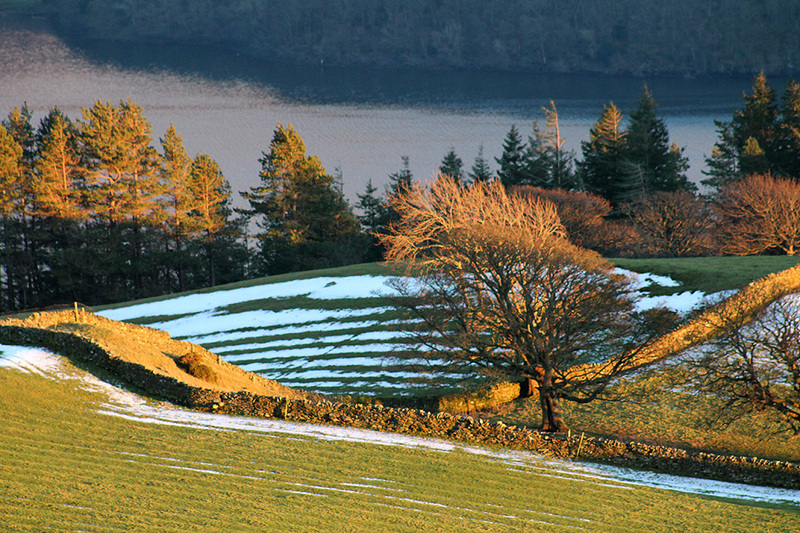 The afternoon sun is catching the trees and the snow-filled furrows below. but it sits in the shadow cast by the nearby bank and so was less inviting at this time of day. 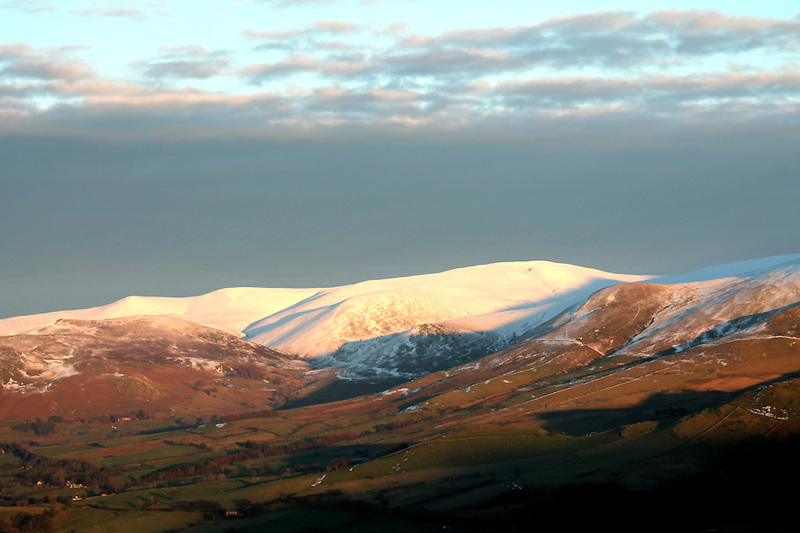 Far better to catch the late afternoon light on the highest ground . . . and enjoy a last look at the winter scene spread out before us. and the dogs take on an even deeper hue. The seat we passed earlier is in the shade on the left. 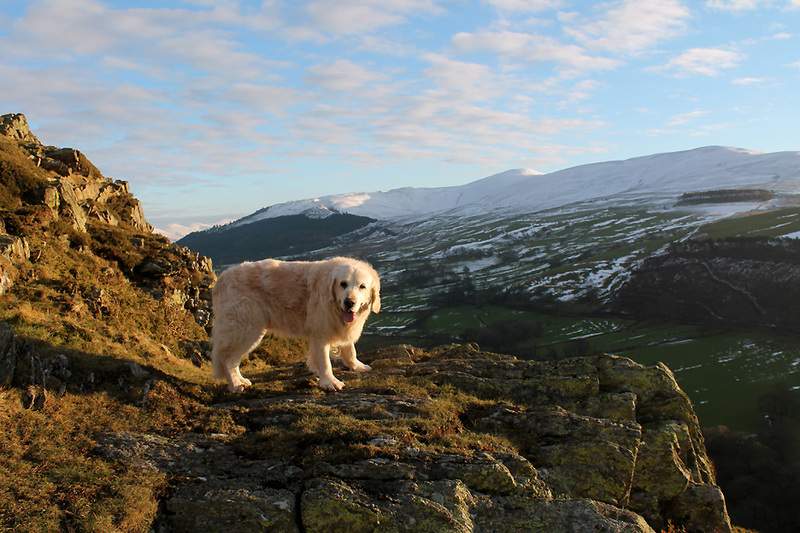 We chose the high ground for our return walk rather than drop down the front of Lothwaite and return via the old church. Dylan was spooked by a snowman on the way back. He barked and barked until he was sure it wasn't going to cause him problems. 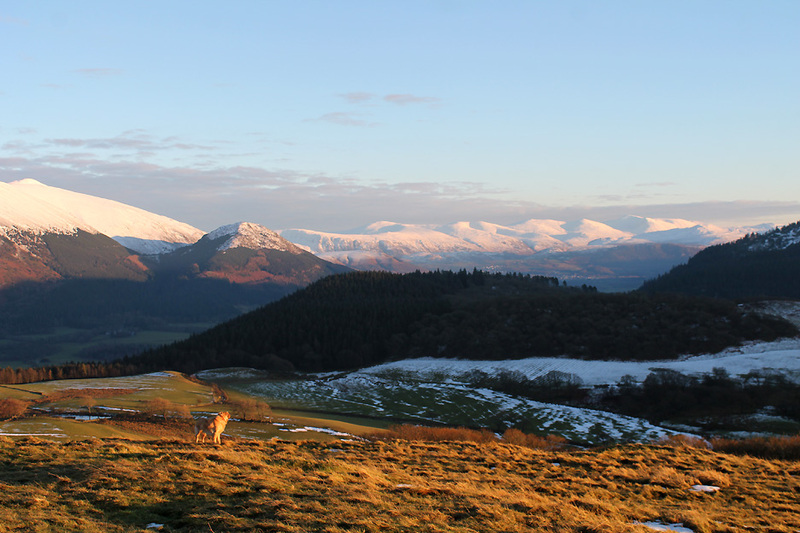 as the pink hue to the snow covered fells would soon turn to a bland grey and we need to be back at the car before dusk. It had been a great afternoon . . . cold but fine. 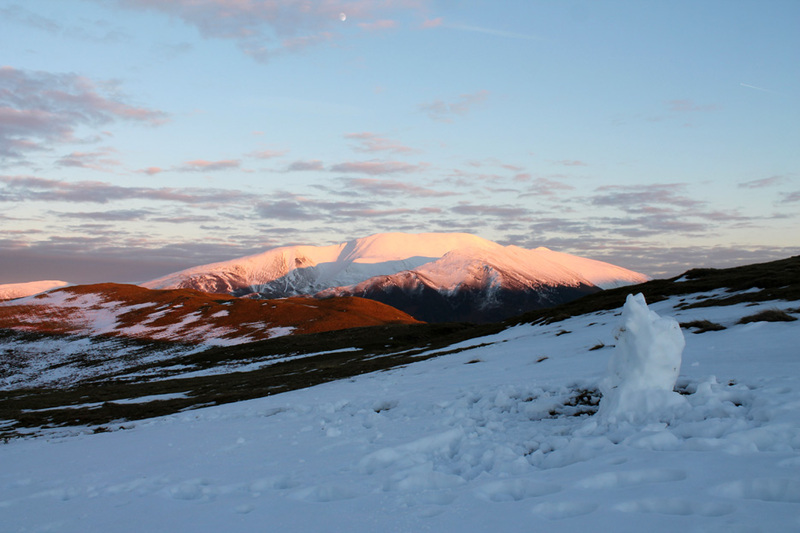 The snow has giving The Lakes a winter blanket that would be remembered by many a visitor once this week was out. The following day . . . the weather did break and we had a very different day in prospect. Southerly winds and an overcast sky heralded the arrival of a warm front . . . "Mild" I think the weather men call it ! 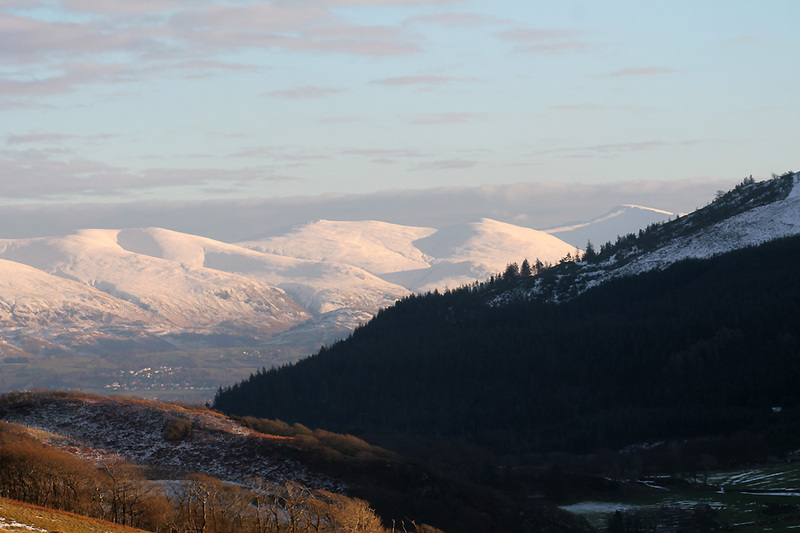 The snow was fast melting from the tops as the morning progressed. 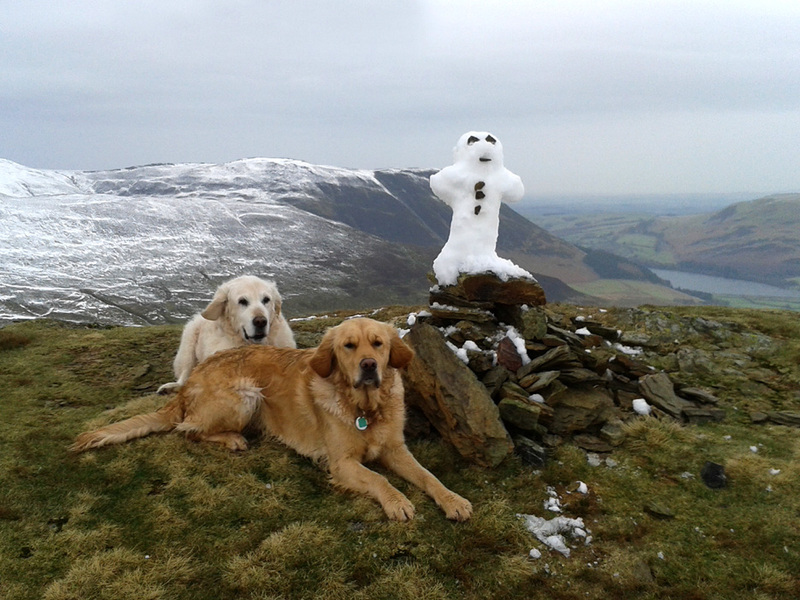 It was a slightly slushy snow walk to the top of Hen Comb but there were still hollows that held enough snow to make a snowman. The dogs were impressed anyway ! 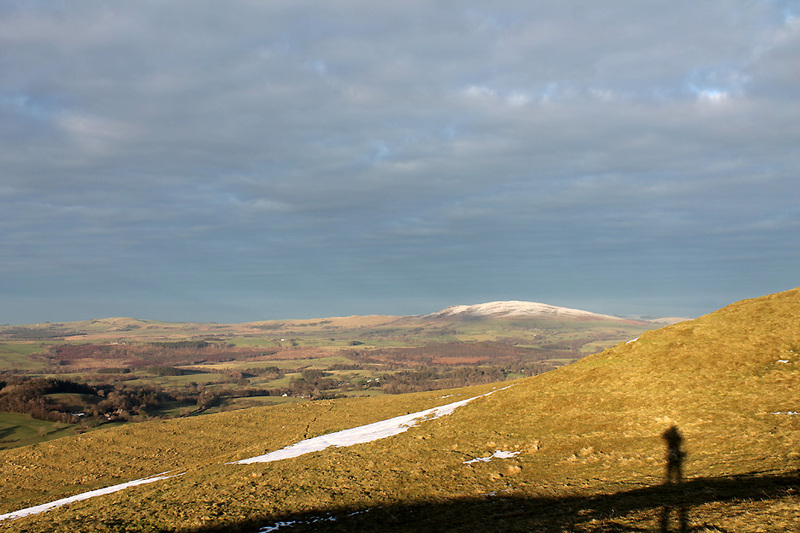 On the way back I turned for a last view of the snow covered tops before the dark rain clouds swept in from the west. Technical note: Pictures taken with my Canon 1100D Digital SLR (or the last two on my Samsung phone). This site best viewed with . . . a winter high pressure over the UK.